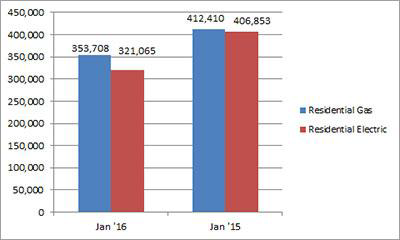 U.S. shipments of residential gas storage water heaters for January 2016 decreased 14.2 percent to 353,708 units, down from 412,410 units shipped in January 2015. 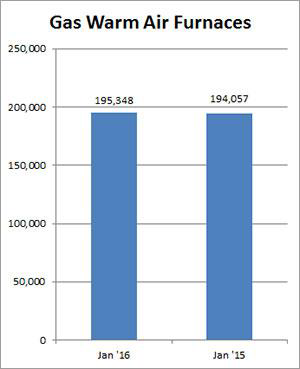 Residential electric storage water heater shipments decreased 21.1 percent in January 2016 to 321,065 units, down from 406,853 units shipped in January 2015. Commercial gas storage water heater shipments decreased 10.8 percent in January 2016 to 7,125 units, down from 7,991 units shipped in January 2015. Commercial electric storage water heater shipments increased 30.3 percent in January 2016 to 7,196 units, up from 5,524 units shipped in January 2015. U.S. shipments of gas warm air furnaces for January 2016 increased 0.7 percent to 195,348 units, up from 194,057 units shipped in January 2015. 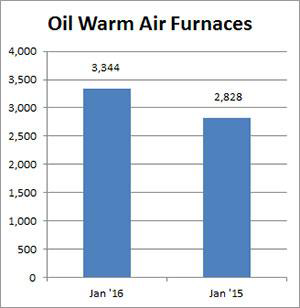 Oil warm air furnace shipments increased 18.2 percent to 3,344 units in January 2016, up from 2,828 units shipped in January 2015. 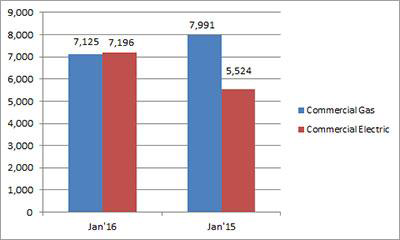 U.S. shipments of central air conditioners and air-source heat pumps totaled 424,102 units in January 2016, down 11.6 percent from 479,484 units shipped in January 2015. 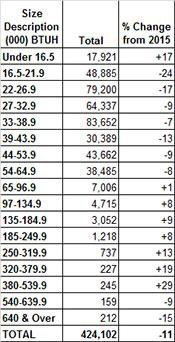 U.S. shipments of air conditioners decreased 10.7 percent to 257,616 units, down from 288,361 units shipped in January 2015. 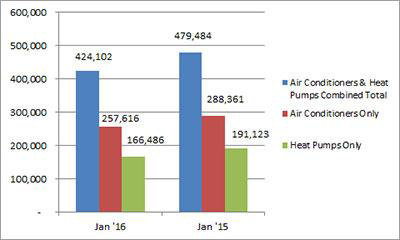 U.S. shipments of air-source heat pumps decreased 12.9 percent to 166,486 units, down from 191,123 units shipped in January 2015..